With nightly game specials every single day, happy hour and a varied menu selection you can munch on tableside while you play some poker, Silks Poker Room in Tampa Bay Downs has all the ingredients for a great night out with some friends! And if you're serious about your poker game, there are plenty of tournaments and opportunities for a winning hand. On Wednesdays, Silks Poker Room has a no-rake tournament that is a wonderful benefit for maximum player profit as well as maintaining a good speed for each hand. Some poker specials include $1,000 Guaranteed Mega Stack $55 Buy-ins on Fridays and Super Stack Blitz NLH $70 Buy-ins on Saturdays. 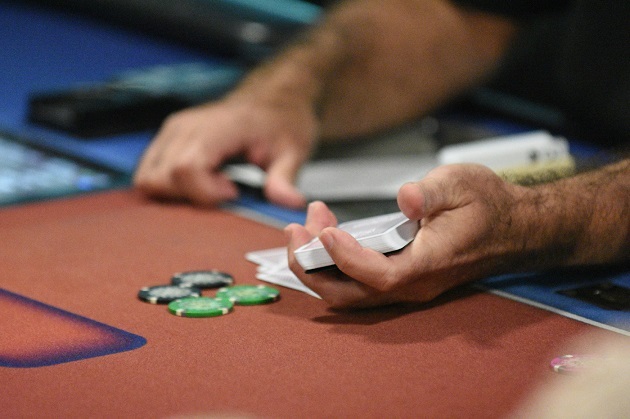 They have a variety of tournaments happening as the Ante Up Poker Tour, which started in August and ends in May, was created by The Bay Area Poker Club. Those who have the highest average of points are sent to play at the WSOP in Las Vegas with expenses provided by the club. If you want to quench your appetite before you start playing, breakfast starts at 9:30 a.m. with delicious options like omelets, wraps, and sandwiches. Throughout the day they have a selection of salads and appetizers, as well as sandwiches, burgers and even upscale entrees and pastas! The variety is endless. Happy hour specials include as low as $2.50 for domestic drafts and bottles and single well liquor drinks and $3.00 for house wines. The amazing staff service and the friendly atmosphere will get you hooked! As if playing poker isn't addicting enough. Looking for more fun things to do in Tampa? Register with 813area and you won't miss out. Best of all, it's free!